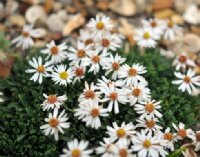 Rock perennial from USA with lance shaped mid green foliage and clear white flowers with yellow centres. A very small species from southwestern USA. Foliage is mid green in colour and lance shaped, forming tiny rosettes. From these rosettes rise very short flower stems to around 2 cms or so, each carries a single daisy-like flower - clear white in colour with a disc of golden yellow in the centre. 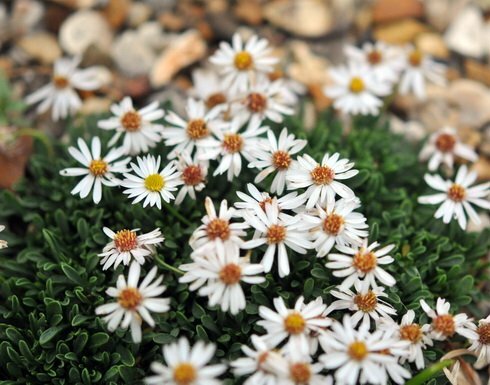 A typical daisy-like flowered plant which is ideal for the rock garden or trough - or the show bench!